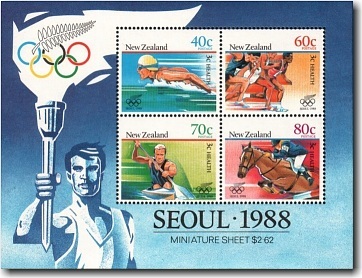 The 1988 Health Stamp Issue commemorated the Summer Olympics, officially known as the Games of the XXIV Olympiad, held in Seoul, South Korea. 160 nations were represented by a total of 8,391 athletes. These were the last games where the Soviet Union and East Germany attended as Germany was reunified and the Soviet Union had dissolved by the next Olympic Games. North Korea was still officially at war with South Korea and boycotted the event. However, the much larger boycotts seen in the previous three summer Olympics were avoided, resulting in the largest number of participating nations to that date. Ian Ferguson and Paul MacDonald - Canoeing, Men's K2 500 metre Kayak Pairs. They also won a silver medal for the Men's K2 1,000 metre Kayak Pairs and Paul MacDonald won a bronze in the Men's K1 500 metre Kayak Singles. 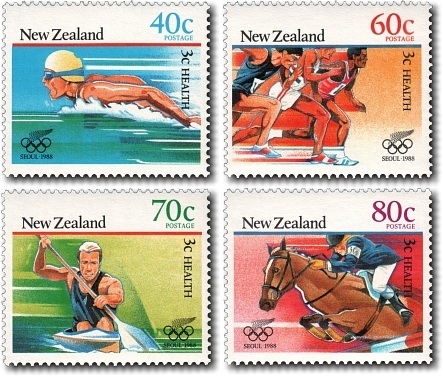 The four stamps in this issue were also incorporated into a miniature sheet.